Effective January 1, 2018, the mileage rate paid to persons traveling in privately owned vehicles on official business for the state will be 54.5 cents per mile (up from 53.5 cents in 2017). The mileage rate for moving will be 18 cents per mile (up from 17 cents in 2017). These mileage rates are available in Concur and on the Accounts Payable website Mileage Rates page. 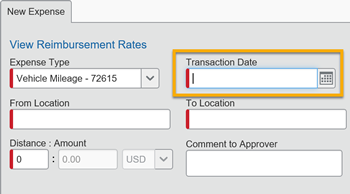 When entering mileage in your Concur Expense Report, please ensure that you are including the correct Transaction Date in the Mileage Form. For example, if travel occurred in 2017, please ensure you have entered the correct transaction date in 2017 in order to properly calculate the mileage.